GoPro. Emphasis on the Pro. I was a happy and proud owner of a GoPro HD Hero. Then the Hero 2 came out. I was bummed that mine didn’t have the adjustable field of view but over all it was no big deal. 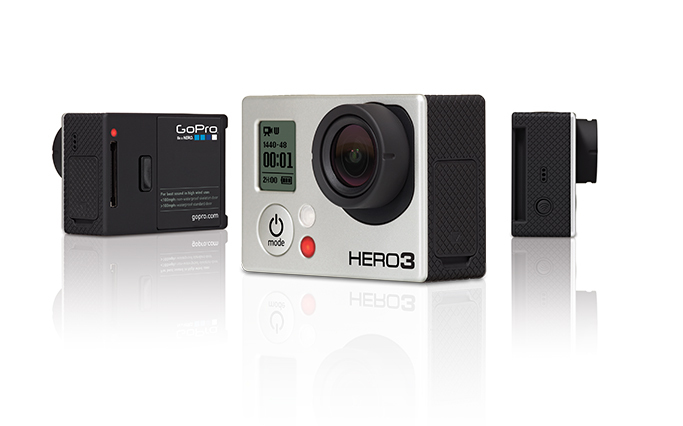 Then Go Pro released the GoPro Hero 3 Black Edition and completely out did themselves. Go Pros have always been good cameras but they are the extra camera. The video quality is good but you also have the excuse “well the camera is super small. What do you expect?” You can take that excuse and throw it out the window. The new camera is playing with the big boys now. Have $7000? Buy a parasail! When left to my own devices I dream up many crazy things to do with my life. Often they involve travel and more often than not they involve doing something that is out of the norm (after all who wants to do stuff that everyone and their mother does?). Enter Paramotoring. It’s basically like parachuting upside down. First off you have a motor strapped to your back, start it up and defy gravity. Really the best way is just to see it. When I travel I think I’m going to be packing this in my luggage for those times when I want to see the top of the mountain but I don’t feel like climbing. Watch This! Pick of the month… week.. day.. hour? I find that I spend a ridiculous amount of time on the internet. I have woken up with my iPhone in my hand and me surfing the web on Safari. How I got there I still don’t know. All this hitchhiking on the super highway we have come to call the web has gotten me lost more than once. I mean why not waste hours on end seeing what double digit millions can buy you on the beaches of SoCal? Every once and a while it does lead me something great. Enter Casey Neistat. A man who was able to do what has been a dream of mine for as long as I can remember, travel the world. Best part? Nike paid him to do this.